Hand Made Turkish Natural Original Kilim.square kilim white and black. 5'1"x6'3" Feet. Made with Cotton and Cotton. Handmade Rag rug Kilim Rug Turkish Cotton Kilim Large Area Rug Actual100" x 134"
Turkish Hand Woven Kilim Rug. Backside special cotton coating. Weight : ~ 33 lbs - 15 kg. Age: 50 years old. Hand Woven Turkish Kilim rug Large Runner 5x11. Condition :Used. In okay condition. Rug is not perfectly rectangular. Material : 90% cotton 10% wool. Age: 80-90 years old. One Nuratanim suzani (a half-size suzani) has the classic sprays of flowers and a central star and then another motif, common in the region, that may represent either two little coffee pots or two ewers for rose water—in either case, symbols of hospitality, prosperity and joy. 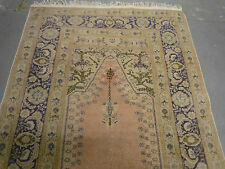 OLD TURKISH KAYSERI 'ART SILK' RUG, PRAYER SAF DESIGN, BIRDS & ANIMALS, C 1920. Antique Anatolian Kayseri 'art silk' saf prayer rug, beautifully drawn with prayer niches containing trees, birds and animals. A very silky rug almost impossible to photograph due to the shine. Beautiful rugs using this process have been made since the end of the 19th century. Antique Crochet table cover. 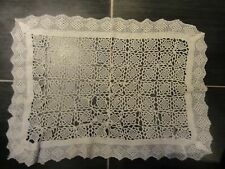 26"X 19"
Antique, unique, rectangular crochet table cover. 26" X 19". Circa 1920s handmade cotton dhurrie. origin : Northern India. material : pure cotton. LOVELY striped, colorful pattern! ~ ~ ~ This textile uses such beautiful colors including pinks, reds, greens, blues, black and neutrals! There is a hem on each end in a pink fabric. There is an amazing section of hand stitched patches on this rug that is so charming! Circa 1920s handmade cotton dhurrie. excellent condition, no holes, no worn areas,, less used dhurrie. origin : Norther India. The embroidery is in very good condition up to the point of the rim where a bit is missing (about 7 cm long by 2 cm wide). Beautiful Design and Colour. Size: 1.7' x 2.9' ( 53cm x 90cm ). The rug is in original good condition. -circa: 1920s. -style: Braided. One Royal Art. Size: 2.6' x 4.6' ( 79cm x 140cm ). It is in original good condition. -style: Hooked. -circa: 1930s. One Royal Art. Vintage Disney Rug 38" x 21" - Circus Elephant (1950's). Shipped with USPS Parcel Select Ground. Size: 2.4' x 3.1' (74cm x 95cm). -circa: 1920s. It has been made in the beginning of 20th century in USA. -style: Braided. One Royal Art. Size: 1.9' x 2.7' ( 58cm x 82cm ). The rug made in cotton in red, navy and yellow shades. -circa: 1920s. -style: Braided. Size: 2.5' x 2.9' ( 77cm x 88cm ). It is made out of cotton stripes in different shades of blue and red. -circa: 1920s. -style: Braided. One Royal Art. Size: 1.3' x 2.4' ( 39cm x 73cm ). -circa: 1930s. -style: Braided. One Royal Art. Rug Type Persian Lavar Ravar Kerman. Style Persian. Ends are overcast with short fringes which in turn cover the flat woven end part, which is still intact on the other side. It is made from high quality Manchester wool pile on a cotton foundation. Handmade antique Indian Dhurri kilim. -size: 5.4' x 7.8' ( 167cm x 238cm ). This kilim has very simple stripes motive in dark green, white and grey shades. -style: Kilim. -circa: 1930s. One Royal Art. Handmade antique Tunisian flat-weave kilim. This flat-weave made in Tunis around 1930s. The kilim made in bamboo cotton, it is very strong. -circa: 1930s. -background colors: grey, pink, orange, sky blue, yellow, green. Handmade antique Indian Dhurri kilim. Antique hand made Indian Dhurri kilim in original good condition. It is from the middle of 20th century, made in tribal design. -size: 5.7' x 8.8' ( 174cm x 268cm ). Size: 1,7' x 3' ( 54cm x 92cm ). -style: Braided. One Royal Art. -circa: 1920. This folk art pillow case is used,is placed at the back of the bench in taverns.They are not produced now.